RECORDED AT "SCHLACHTHOF" BREMEN BY BLUESOUND / MARKUS DANNE. RECORDING DATE: 16.03.2002. MIXED BY T(I)NC IN SWEDEN. ARTWORK: HUGO SUNDKVIST. PHOTOS © BY: ACHIM FRIEDERICH AND BOB STUART. 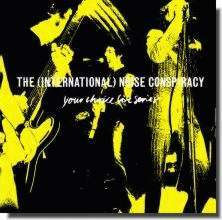 YCR 025 THE (INTERNATIONAL) NOISE CONSPIRACY - LIVE LP / CD.